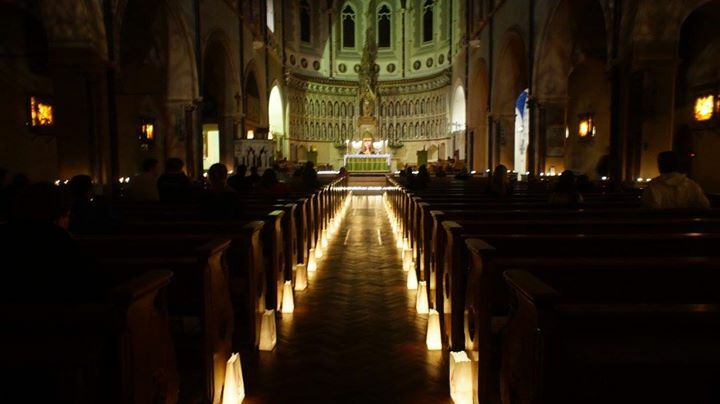 Last Friday evening we had Nightfever again in Oxford - an evening of candlelit adoration, quiet music and constant prayer, during which passers-by are invited to come in, light a candle and pray awhile. As usual, I helped with the setting-up; then, once the Blessed Sacrament was exposed, settled down for an hour or so of prayer. ﻿﻿As people began coming up to light their candles - some hesitant, over-awed, unsure, others clearly at home or at least sure of what to do - I wondered at the effect on them of these few minutes; this unexpected ushering into a hushed, reverent church lit only with the tiny flames and rippling reflections of dozens of tea lights. And I wondered, too, at the effect of being ushered, knowingly or unknowingly, into the Eucharistic Presence at the heart of it all. I found myself recalling the catalyst in the conversion of Mabel Digby, our fifth Superior General, and the first of only two converts (both British) to hold that position. In the early 1850s Mabel was a stubborn teenager, staunchly Protestant and vehemently cold-shouldering her mother and older sister who had become Catholics. Despite her feelings about their new faith, though, she continued to socialise with some Catholic friends, little knowing that they, along with her sister, were plotting and praying for her conversion. Convinced that the answer lay in getting Mabel into the presence of the Blessed Sacrament, they ensured they all just 'happened' to be passing a large church at which a famous choir was about to sing, then pressed around a protesting Mabel and swept her into the building with them. When it became apparent that the choir's 'performance' would be during Benediction Mabel was furious: she couldn't leave, as she was hemmed in, but she could remain angrily, defiantly seated, while her friends knelt around her, fervently praying. And thus she remained, in her furious bubble, until the very end, when, as the priest raised the monstrance, her face softened and she fell to her knees, remaining there long after other worshippers had departed. Whatever it was that Mabel had seen in that Benediction, whatever had touched and spoken to her heart, remained a closely guarded secret, shared only with a few. We can only guess, knowing that contained with that plain, fragile, tiny wafer is a power born of love, strong enough to melt even the fiercest resistance and bring us all to our knees. 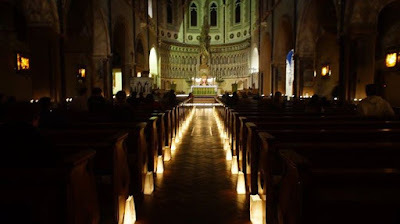 And so I asked Mabel to join me in praying for all those coming to Nightfever; that God, whether bidden or unbidden, might be truly present to us all, touching our hearts with the power of his self-giving love, filling us with the radiance and joy of his undying Presence.